Developing equipment for marine vessels requires manufacturers to consider the safety and comfort of both passengers and pedestrians on the shoreline. A renowned manufacturer of recreational equipment contacted Polymer Technologies to help them reduce the noise produced from their latest outboard motor. The manufacturer's two-cycle motor was producing sound levels 11 to 12 decibels higher than their competitor’s four-cycle motor. The high volume of noise was uncomfortable for passengers and those living and vacationing beside waterways. The manufacturer requested that Polymer help them design and develop acoustical barriers so the noise level produced during operation would be comparable to the competition’s four-cycle outboard motor of equal horsepower. After extensive testing, we determined that the majority of the noise was emitted from the lower exhaust section of the outboard motor, which is just above the waterline. The culprit of the sound source was the motor itself under the upper motor housing, or bonnet. Often, the motor housing is lined with die-cut foam to absorb excess sound. The manufacturer was utilizing a 15 piece die-cut foam solution within the engine compartment, but it was not absorbing noise as required. To improve the manufacturer’s equipment, we realized a bold new custom solution for noise reduction was needed. Our Polymer Molded Products Division (PMP) was up to the challenge of creating high-performance molded foam insulation! 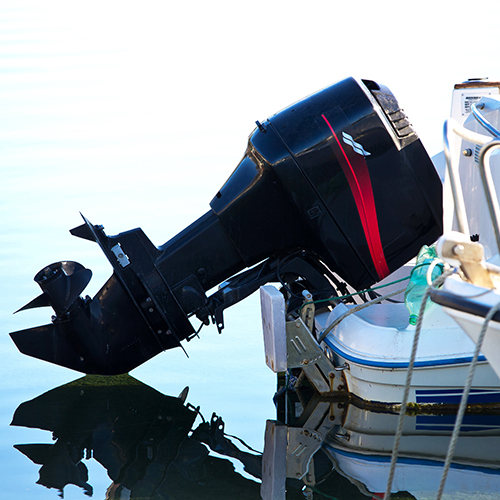 Using our in-house PMP production facilities, we devised a molded foam solution that encapsulated the upper and lower parts of the outboard motor to reduce noise. We worked with the manufacturer to design and test several iterations of custom molded urethane foam parts. The final design utilized two different types of molded foam to meet the manufacturer’s noise absorption and environmental requirements. POLYFORM® High-Density Molded Foam with Integral Skin surrounded the lower unit of the motor below the waterline, providing a higher level of containment and energy absorption. The integral skin helped to prevent water absorption while providing noise reduction. The upper motor cover, or the bonnet, was lined with a large, single piece of molded POLYFORM® High-Density Molded Foam without the integral skin. While both of our POLYFORM® molded foams are suitable for mitigating excess noise, non skinned molded foam provides a higher level of noise absorption. POLYFORM® non skinned was an ideal choice for insulating the upper motor cover because that section of the motor produced the most noise and was not submerged. The end result was the creation of acoustical absorptive and barrier parts for the two-cycle outboard motor that reduced noise and sound energy as desired. This resulting sound reduction was at levels equal to and, in some RPM ranges, below that of the industry-leading four-cycle competitor. By switching to a molded foam solution, the manufacturer was able to reduce noise while also eliminating the number of parts and assembly time needed. Custom molded foam solutions help manufacturers solve energy management problems and improve assembly processes. When designers consider molded foam products at the beginning of a project, OEMs can develop more simplified assembly processes that increase noise reduction, improve assembly time, and reduce the number of parts required from the start. By thinking forward with innovative solutions like molded foam, manufacturers can eliminate the need to return to the drawing board to address noise, vibration, and thermal challenges. If the possibilities of a molded foam solution excite you, then be bold and develop your own custom mold with our PMP Division.